Long non-coding RNAs (LncRNAs) are a class of non coding RNAs longer than 200 nt. Because of their regulatory roles in diverse biological functions and human diseases, the expression of LncRNAs has obtained more and more attention in scientific research. However, due to the characteristics of lncRNAs, RNA-seq is inadequate for lowly expressed RNAs, especially LncRNAs. (Fig. 1). Figure 1. Actual RNA-seq data showing the relationship between RNA abundance (horizontal axis in log2 scale) and percentage of the RNA transcripts that can be accurately quantified (vertical axis) . The typical coverages of mRNAs (blue circle) and lncRNAs red (circle) in a RNA-seq depth of 30M are indicated. 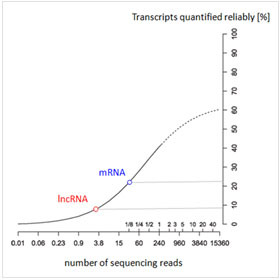 Less than 10% of lncRNAs may be reliably quantified. LncRNAs are hybridized with sequence specific probes, relatively independent of high abundance RNAs. LncRNAs are expressed at much lower levels at ~1/10 of mRNAs [1-7], making quantification of > 90% lncRNAs inaccurate and unreliable [8-9] (Fig.1). High sensitivity as low as 1 transcript/cell. Several times more lncRNAs are routinely detectable . Less sensitive for lncRNAs. Several times less lncRNAs detected even with very deep sequencing . Special strand direction aware sequencing library prep required. Arraystar LncRNA database to provide comprehensive, high quality lncRNA array contents. Unambiguous transcript isoform/variant specific detection and quantification. Read mapping to lncRNAs requires lncRNA reference database. Novel lncRNA discovery by de novo lncRNA transcript assembly difficult and not available in generic RNA-seq services. Not a mature technology, still undergoing rapid evolution of methodologies . • Circular RNA Microarrays New! • Arraystar Epigenetic Microarrays New! • Circular RNA Microarray Service New! • The number of samples, species of interest, and the conditions of the samples to be submitted. • The experimental design with the type and number of arrays to be performed.